Hi there. Guess what I've been up to this week. You'll never guess. Well, you might, given my blethering on about on The One Show. 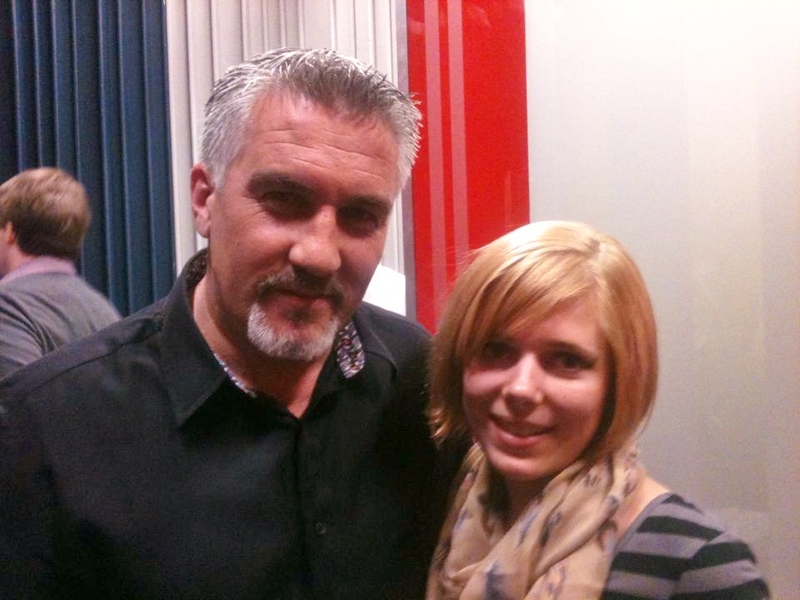 I was on that very show this very Wednesday, and I actually stood next to the George Clooney of baking, Mr Paul Hollywood. That's me, just right of Paul, looking slightly uneasy. Well, wouldn't you? I was thinking things like: "What does he think of my cake? Am I really on TV? Are my friends watching? Are my parents watching? SHOULD I HAVE WORN LIPSTICK?!" Anyway, given my constant wittering on about Mary and Paul and hunger for approval from real actual bakers, I am sure you appreciate how exciting this experience was for me. I mean, he actually spoke to me, permitted me to have a photo taken with him, and signed his book for me. You can probably tell from this photo how excited this all was for me, given how red and vaguely crazy I look. 1. Preheat the oven to 180C/gas 4, grease the two sandwich tins and line the bases with greaseproof paper. 2. Whisk the oil and muscovado sugar together, then whisk in the eggs one at a time. 3. Mix in the grated carrots and sultanas, then sift the flour and spices into the bowl and fold them in with a large metal spoon or spatula. 4. Divide the cake mixture between the prepared tins and bake for 30-40 minutes (it will be less for a fan oven, I only had to bake them for 20-25 minutes) until golden and a skewer inserted into the centre comes out clean. Remove from the oven and leave in tins for 10 minutes, before leaving to cool on a wire rack. 5. To make the icing, add the boiling water, caster sugar and powdered egg whites to a very clean metal boil, whisk a little then add the vanilla extract and continue to whisk until stiff peaks form. 6. Cream together the butter and icing sugar in a separate bowl, then combine the two mixtures and beat until they come together to form a shiny, fluffy buttercream that will hold its form when piped or spread. The mixture may curdle at first – keep beating and it will come together. 7. Level off the top of one of the cakes with a sharp knife and spread with buttercream. Put the other on top and spread the sides and top with buttercream. When you have smoothed the icing as much as possible, take the chopped walnuts and press them onto the sides of the cake until covered. 8. To make the carrot cake toppers, put the water and caster sugar into a large shallow pan and heat until sugar has dissolved. Add the carrots and heat gently, without stirring, until the syrup turns into caramel. Remove the carrots and leave on a sheet of greaseproof paper to cool and harden. 9. When the carrots have cooled and the caramel has set, arrange them on the cake as in the picture above. Then take the sugarpaste and roll out. Cut into strips lengthwise and then cut across at 1cm intervals. Take 3 of the small strips and press them together at one end, then tuck that end under a carrot. Repeat until all the carrots have a green topping. And you're done! A cake fit for HD television. And I'm sure it was much enjoyed by the BBC staff on The One Show, where I left it rather than lug it back home on the tube. A one hour train journey followed by a half hour tube journey feels a lot longer when you are carrying a cake, an acute feeling of anticipation/gut twisting nervousness, and all your baking hopes and dreams.